Shipping Time -- Most orders received before 12:00PM will ship the same day or the next business day, provided the product ordered is in stock. Most orders received after 12:00 PM will ship within 48 hours. Orders are not processed or shipped on Saturday or Sunday. Orders sent within the US are sent via UPS Ground at a UPS published rate. Unless otherwise requested, our default shipping method will be UPS ground. Shipments outside of the continental United States will be shipped via USPS Priority. A processing fee of $3.00 per package will be added to the actual cost of the actual freight cost for shipments outside of the continental United States. Requests for courier aside from the default couriers will include a $3.00 processing fee per package. 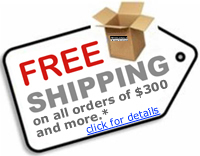 Requests for expedited UPS shipping will incur an expedited fee of $5.00. Freight is billed on all orders that are shipped. This includes all back orders. Garments from different manufacturers may ship in separate packages. Surcharges and / or additional freight charges incurred may be charged to the customer. The most common reasons for these charges include, but are not limited to, multiple delivery attempts and incorrect shipping information provided by the customer.